We’re excited to announce our new integration with Zendesk! With many of the world’s largest organizations using Zendesk to provide support to their customers, this direct integration will enable your team to map real-time data across both platforms and enhance your customer service. 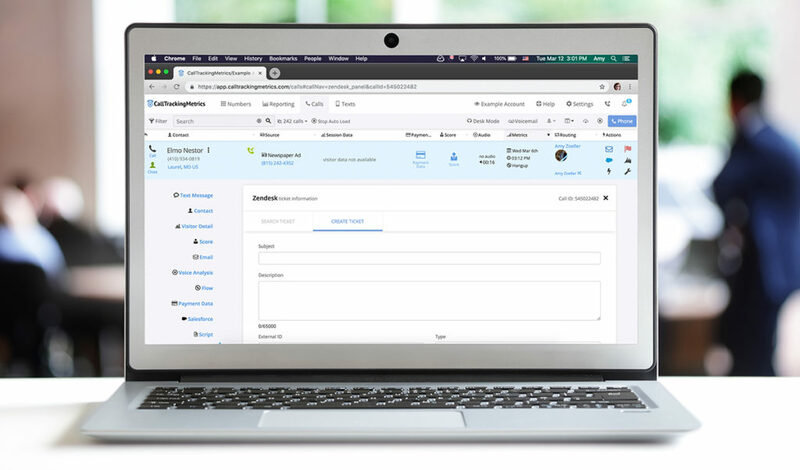 Plus, you’ll be able to combine the powerful support tools Zendesk offers with the conversation and contact data we deliver at CallTrackingMetrics—thereby closing the gap between your support and sales interactions. Create Zendesk tickets directly in the CallTrackingMetrics activity log, eliminating the need for your agents to switch back and forth between platforms. Access a caller’s previous ticket history in Zendesk alongside the CallTrackingMetrics softphone in the call log. This helps you get up to speed on past issues and resolve requests more quickly. Search past Zendesk ticket history within CallTrackingMetrics, using custom criteria and keywords/tags to isolate repeat issues or concerns mentioned on phone interactions. Map CallTrackingMetrics agents and fields to matching criteria in Zendesk, helping you gain full visibility into your customer conversations across both platforms. Empower your support team with tools to save them time and resources on every customer interaction. You can gather data from your conversations and contacts using our software, then send that data to your Zendesk account for a comprehensive overview of your customer experience. Learn more about how to set up the integration in our Support Hub. Note: this integration is exclusive to our Contact Center plan and requires an account with Zendesk. Need help reviewing or upgrading your plan? Explore options or make the switch now.